By Ingrid and Ryan Rodrick Beiler, former MCC Palestine staff. Adapted by Jessy Hampton, advocacy and learning tour assistant for MCC Palestine. Mitri Ghounam is a Palestinian Christian who was born in Jaffa, south of Tel Aviv, in 1946. His family fled to Beit Jala, near Bethlehem in the West Bank, during the Nakba (Arabic for “catastrophe,” how the Palestinians refer to the events before and after 1948 which saw the creation of the state of Israel). When war broke out in 1967, Ghounam was on his honeymoon outside of the country; Israel refused to allow him and his wife to return home until 1979. With his modest taxi driver’s salary, he bought land near his home and raised olive and almond trees. Now more than 550 acres of his land have been confiscated by the Israeli separation wall which overshadows his home. Like many Palestinians, Ghounam has considered emigrating. Though some claim that Palestinian Christians are leaving due to persecution by Muslim extremists, a poll carried out by the Palestinian Center for Research and Cultural Dialogue showed that the majority of Christians who emigrate from Palestine are doing so because of the economic and political situation caused by the Israeli military occupation–the same reasons that many Palestinian Muslims are leaving. The separation wall is only one iteration of the policies of annexation and isolation put forth by the Israeli government, but it is one of the more overt policies, with 273 miles already constructed and a total of 439 miles planned. 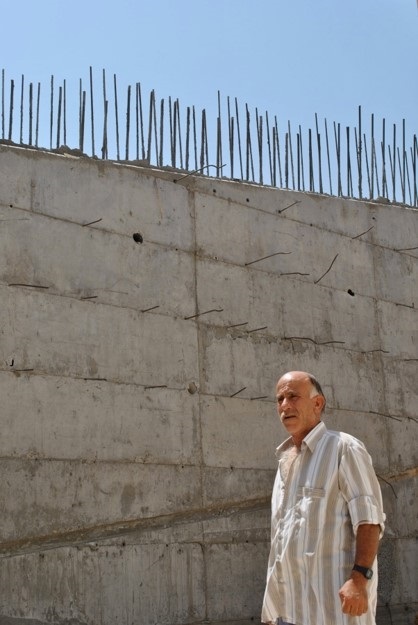 As the wall grows, more and more families, some of whom are refugees like Ghounam, will find themselves in its path.